1. 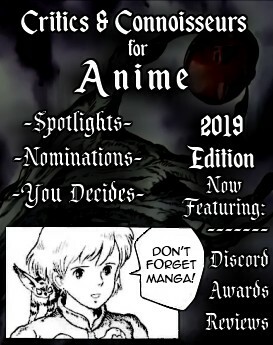 To have members nominate an anime or manga series that they believe is of particularly high quality and that deserve to be added to our 'Club Related' list. 2. To then have a discussion thread for members to debate the good and negative aspects of the nominated series. 3. To then hold a poll to decide if that nomination truly deserves to be added to our 'Club Related' list. 4. If it is decided that a series is befitting a position on our 'Club Related' list then we will go one step further and create a small committee to write for the series a proper review. It will then be posted on the series' page under this account: TheCriticsClub. This would be our way of putting a stamp of approval to a select few series that belong to the upper echelons of their respective medium. The most important thing is participation in the You Decide Polls so that is how we measure activity within the club: 1. If you fail to vote in a single You Decide poll in a given week, you receive a STRIKE. 2. If you accumulate 3 STRIKES in a month, then you will be removed from the club due to inactivity. STRIKES won't rollover so each month you start with a clean slate of 0 STRIKES. However, we are very lenient with this so if you know ahead of time that you won't be online, just message ShadowGentleman and your absence will be excused whether it be a single weekend or an extended vacation. Resurrection Calendar Old Spotlights: Click For List Events: The Critics & Connoisseurs Awards: 2015: Discussion Thread 2015: Results 2016: Discussion Thread 2016: Results 2017: Discussion Thread 2017: Results 2018: Discussion Thread 2018: Results Misc. Stuff: C&C Weekly The Blue N Rescue Mission Affiliates: Do you like challenges? Are you looking for one? Test your limits and explore new anime and manga on the way. Anime Watching Challenges Manga Reading Challenges If you have any questions, comments, suggestions: Open Discussion Thread Ideas for Club Improvements Feel Like Joining a Review Team? Review Team Signup Thread Editors and Proof-Readers Signup Thread Need a Recommendation? Anime Recommendations Manga Recommendations Want to just chat with fellow members? Open Discussion Thread You Decide - Afterthoughts Your Favorite Scenes Discord Server: Critics and Connoisseurs Facebook Page: Critics and Connoisseurs GOT QUESTIONS? GET ANSWERS! -------=====Club FAQ=====------- If you are mistakenly kicked due to inactivity, please contact one of the admins and we will get it straightened out. We do make mistakes. Thank you for your patience in the meantime. I guess that makes checking worth it but at the same time it's somewhat perplexing.